SCVHistory.com LW3167 | William S. Hart | Movie Herald: 'The Cradle of Courage' 1920. (Back cover): Click to enlarge. 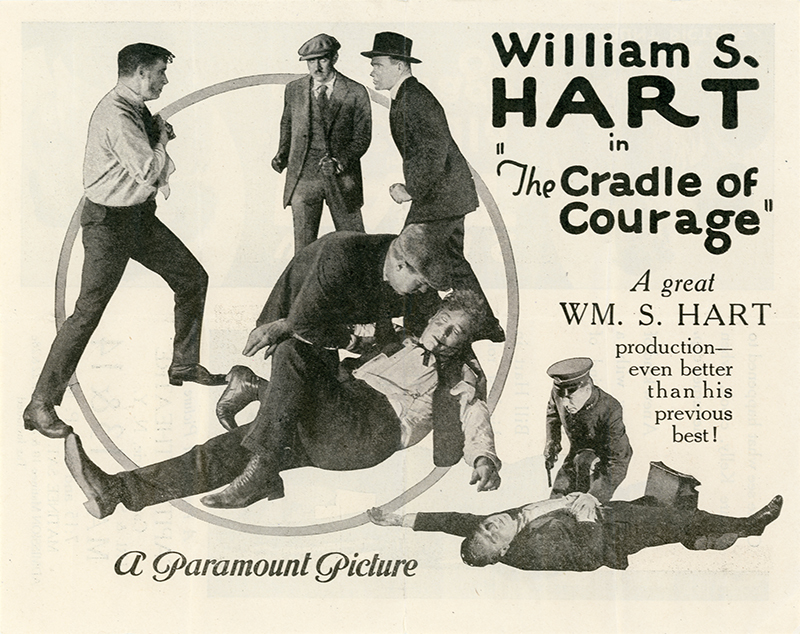 Movie herald (advertising brochure) for the 1920 Paramount-Artcraft feature, "The Cradle of Courage," starring William S. Hart. It's heralding a run at a theater in Montgomery County, New York, May 13-14. No year indicated, but probably 1921; the film premiered on Broadway in September 1920. One double-sided page, 7x9 inches, folded horizontally. Produced by William S. Hart Company; distributed by Paramount-Artcraft; New York premiere September 19, 1920; released October 17, 1920; ©July 26, 1920; five reels (4737 feet). Directed by Lambert Hillyer; screenplay by Lambert Hillyer from a story by Frederick Bradbury; photographed by Joe August; art director, J.C. Hoffner; art titles by Harry Barndollar. CAST: William S. Hart ("Square" Kelly); Ann Little (Rose Tierney); Thomas Santschi (Tierney); Gertrude Claire (Mother Kelly); Francis Thorwald (Jim Kelly); George Williams (Lieutenant Riley). SYNOPSIS: From the "Cradle of Courage" (the American Expeditionary Force in Europe) comes back to San Francisco "Square" Kelly with a fine record though a former leader of a gang of crooks. His chum is the son of a police captain, and the latter feels so kindly disposed toward "Square" that he offers the ex-burglar a place on the force. None of "Square's" friends is at the wharf to meet him, and he feels inclined to make a complete change in his life. On encountering them at their hangout, however, they convince him there is only one existence possible, and enlist his services in a prospective raid. His own mother encourages this, but not Rose, adopted daughter of gang leader Tierney. It is this girl, who has preserved a clean mind in unclean surroundings, who decides the future of "Square." LW3167: 9600 dpi jpeg from original herald purchased 2017 by Leon Worden.